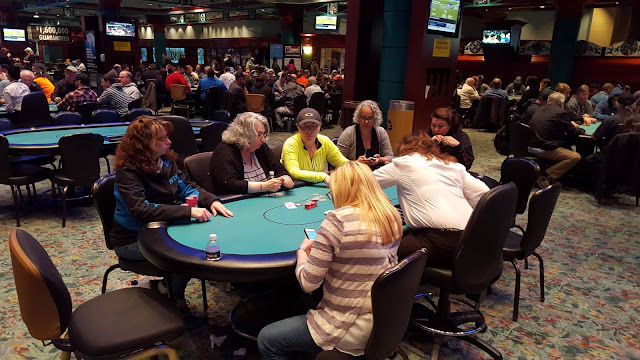 The remaining six players have made a deal in which Sharon Raider (chip leader) will get $3,900, and the five other players (Le-Ann Anderson, Cheryle Drysdale, Stephanie Small, Jill Chamberlin, and Linda Swears) will each take $1,900. They will play it out for the trophy and the additional $652 in cash. Sharon Raider raises to 31,000 in middle position, and Geri Warm shoves all in from the big blind. Raider calls. 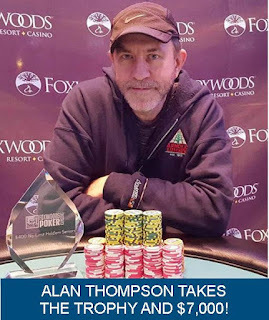 The board runs out [8c][6s][4s][2d][8d], eliminating Warm in 8th place, paying $642. Per a Twitter request, here is the photo of Nick Palma. 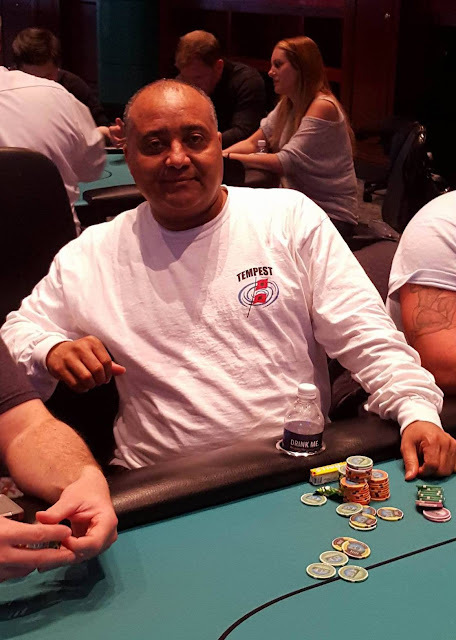 There were a total of 238 entries into today's $250 NLH Turbo Super Stack event. There were a total of 158 entries into today's $1,650 NLH event. 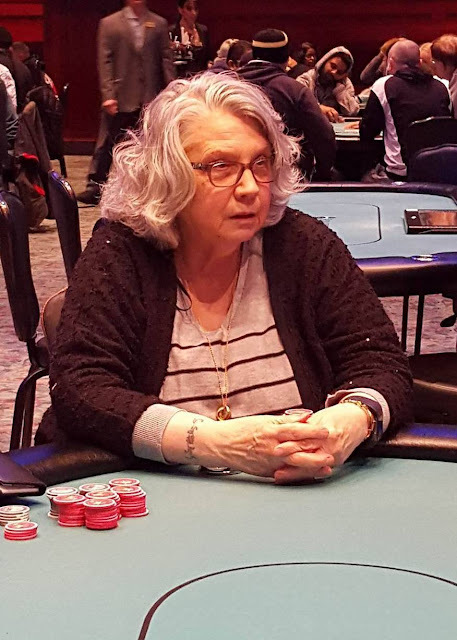 Mary Lockwood has been eliminated from play, and all remaining players are now officially in the money of event #9. 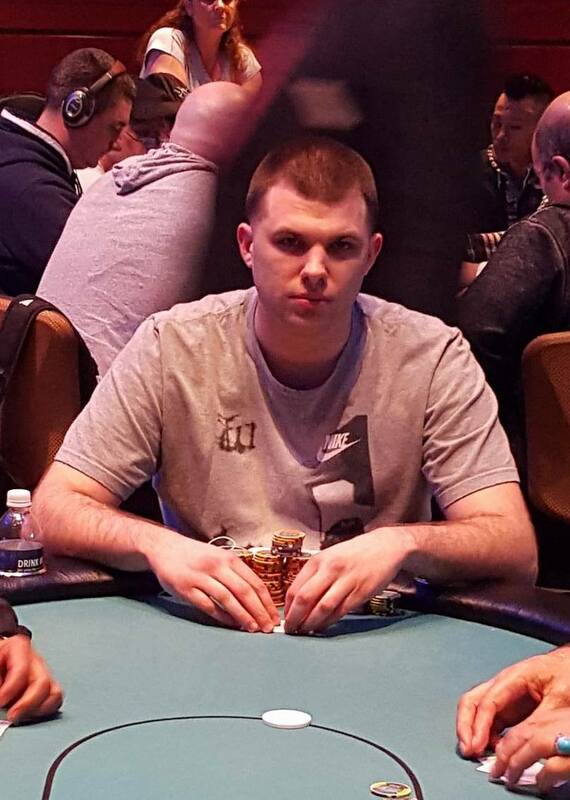 According to Matt Costanzo, Will Failla was just eliminated when Costanzo raised from the cutoff to 2,000, Failla made it 6,500, Costanzo shoved all in, and Failla called. 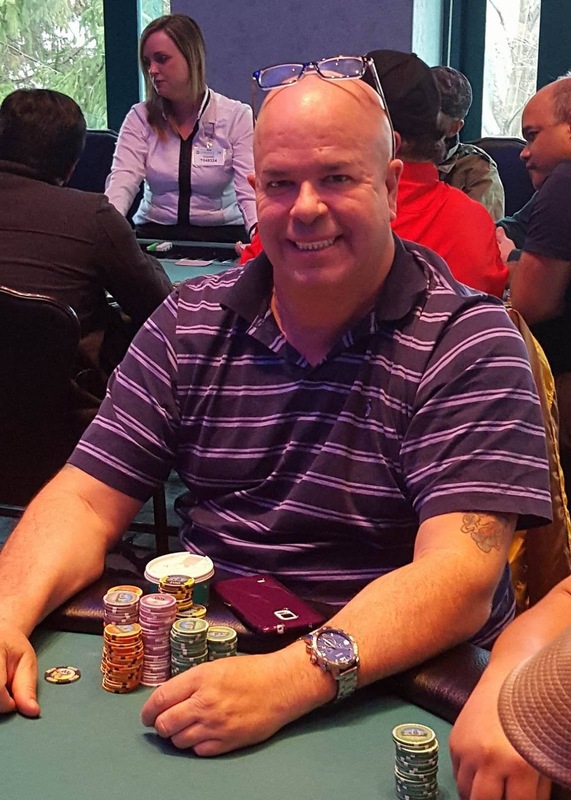 Failla held pocket kings, against Costanzo's ace-king. Costanzo hit an ace on the turn to eliminate Failla from play. Costanzo is now sitting with 155,000. 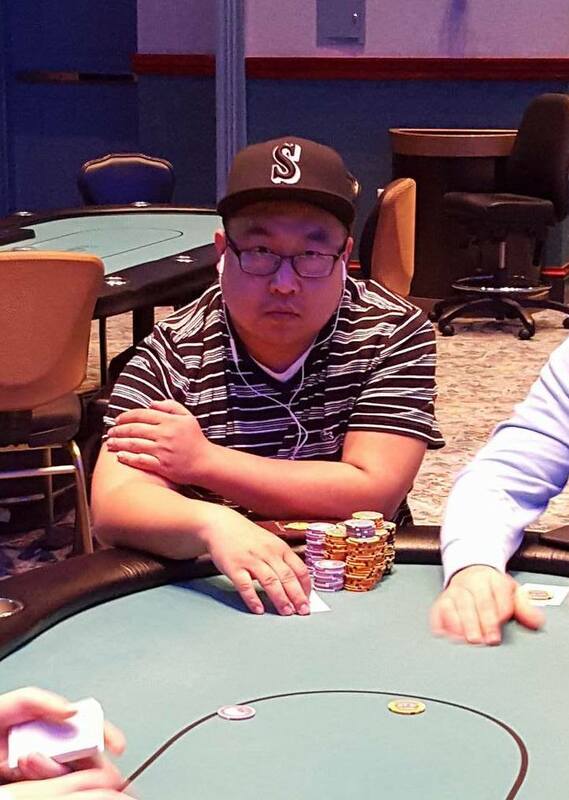 On a board reading [jh][10c][4c], Brian 'Castles' Leblanc checks, Soukha Kachittavong bets 4,700, and Leblanc announces that he is all in. Kachittavong asks for a count. He cuts out the additional 31,000 to call, looks at Leblanc and says, "Jack ten is good," he says as he turns over [kh][jd]. Leblanc slowly turns over [ad][kc]. 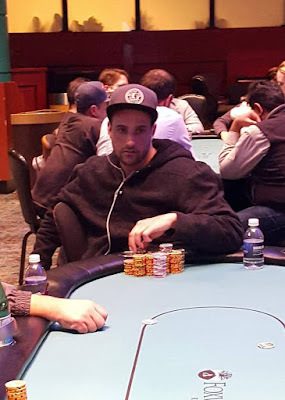 Unfortunately for Leblanc, the [6h] turn and [10d] river do not improve his hand, and he is eliminated from play. After the hand is over, Alex Begazyon tells the table that he had doubled Kachittavong up when they got it all in with kings versus queens, and Kachittavong hit a queen on the flop. Begazyon says those lucky chips he gave "Brother Soukha" helped him to win the hand against Leblanc. 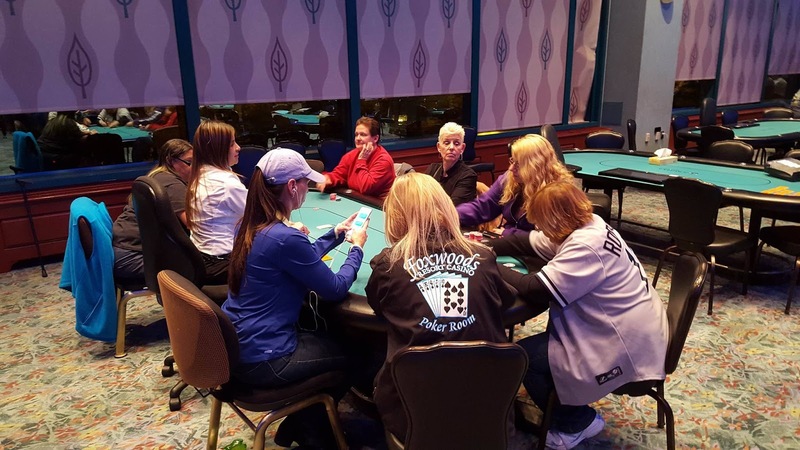 We are down to the final 19 players in the Ladies No Limit Hold Em Event. These players are currently playing 2,000/4,000 blinds with a 500 ante, and the average chip stack is 81,052. 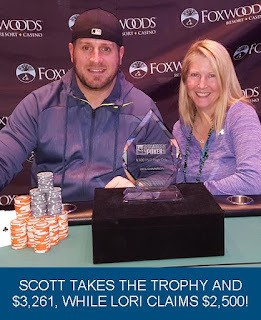 It should be noted that two previous Foxwoods Ladies Event Champions are still in the field. Linda Swears won the $250 Foxwoods Mega Stack Ladies Event this past February. And Heidi Alexander won the Fowoods Poker Classic Ladies Event back to back years in 2010 and 2011. 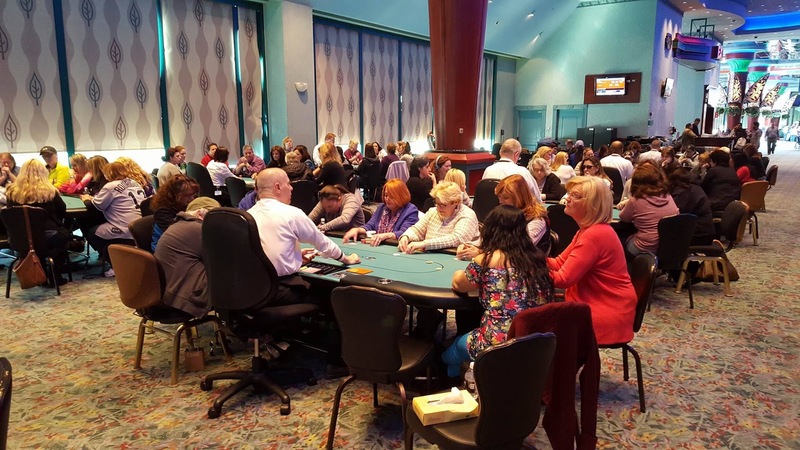 There are currently 18 tables for Event #11, and 205 runners. They are in the midst of level 8 (250/500 blinds with a 75 ante). 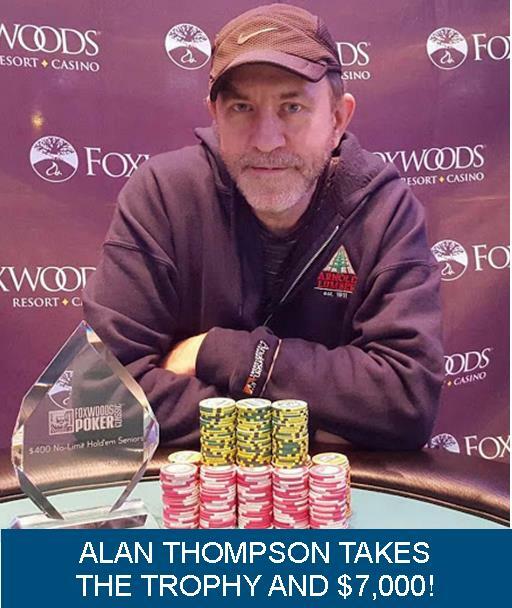 This tournament has a $25,000 guarantee, players start with 40,000 in chips, and levels last 15 minutes. This is a trophy event, and will be played to conclusion tonight. For information on structure please see this link. The remaining players in Event #10 are now on dinner break. They will return to play in 60 minutes with 400/800 blinds and a 100 ante. Anyone wishing to enter/re-enter this event has until the end of the dinner break to do so. Information on structure can be found by clicking this link. On a board reading [qc][10s][6s][qh], a player in the small blind bets 4,500, and Will Failla quickly calls. 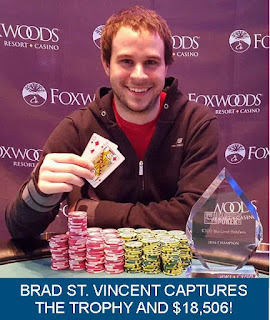 When the river comes the [10c], the player in the blind checks, and Failla makes it 4,500. The blind hesitantly calls. "You have kings, right?" Failla asks. 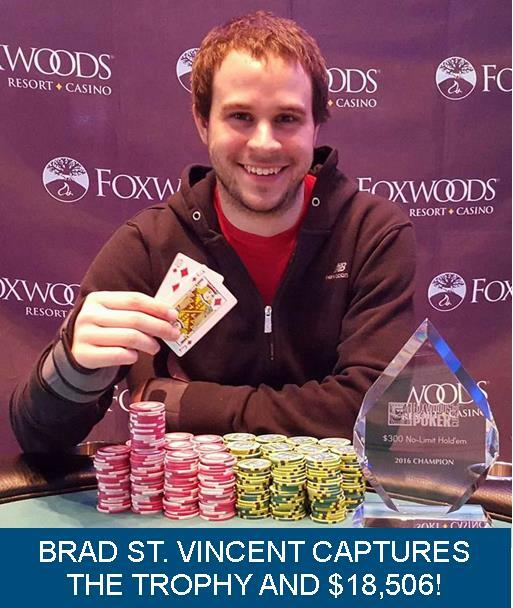 "No, I have aces," the player responds. "I thought so," Failla says as he turns over [6c][6d] for a full house. His opponent shows [as][ac], and throws them in the muck. On a board reading [9d][7c][2h], with Dilip Patel already all in, a player in the small blind checks, Brian 'Castle' Leblanc shoves all in, and the small blind calls. The [3h] turn and [ah] river, means Leblanc will take the pot with his set of nines, and Patel and the other player involved in the hand are sent to the rail. On a board reading [qh][9c][3h][jh][5h], a player in the small blind shoves all in, and Luke Vrabel quickly calls. Vrabel turns over [ah][9h] for the nut flush. His opponent slides his chips over to Vrabel, and mucks his cards face down. Sally Tesoro shoves all in, and Melanie Kaye calls, having Tesoro covered. The flop comes [7h][6h][5h]. "Oooo, a straight flush draw," a player not involved in the hand says to Tesoro. 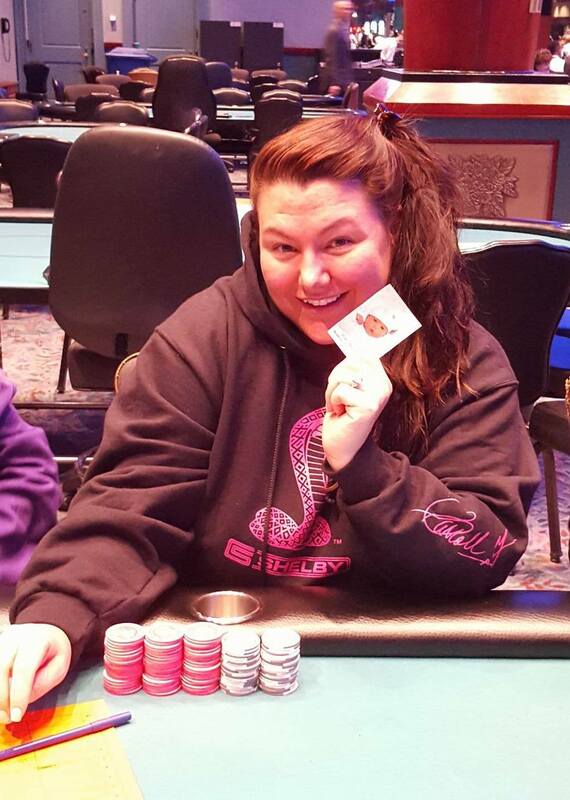 While the [kc] turn and [10d] river did not give Tesoro the straight flush, her straight is enough to award her a full double up. 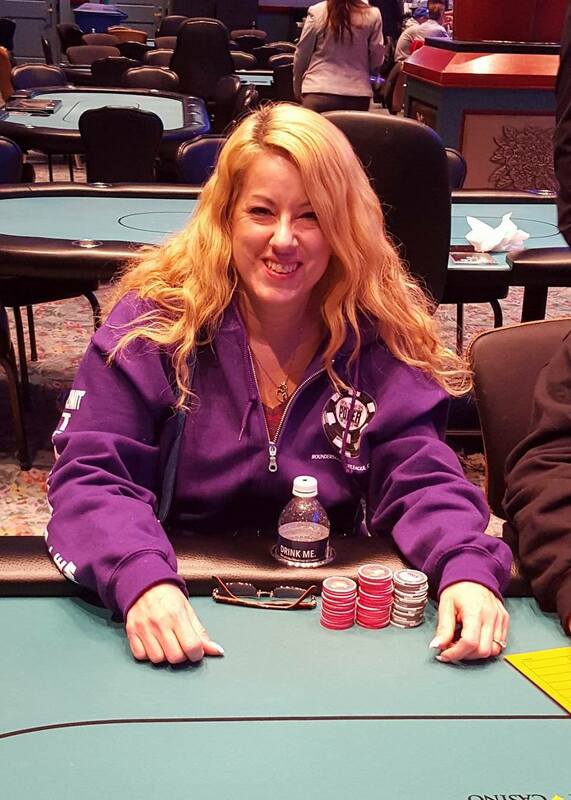 A player in early position shoves all in for 7,700, and Ashley Walecka quickly calls on the button. Francine Lee tanks in the big blind for nearly a minute. She ultimately releases her hand saying, "Chicken, chicken, chicken," referring to her fold. The player in the big blind calls the 7,700. The big blind checks the [jk][7h][5h] flop, and Walecka bets 9,000. The big blind reluctantly releases her hand. The [3s] turn and [10h] river means, Walecka takes the pot, and her opponent is sent to the rail. 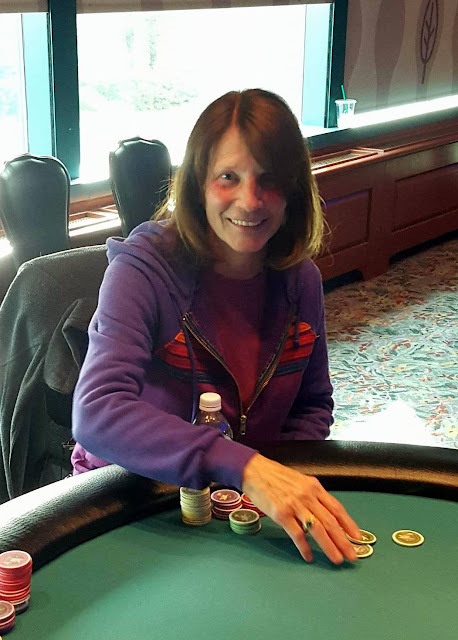 There were a total of 77 entries into today's $250 NLH Ladies event. 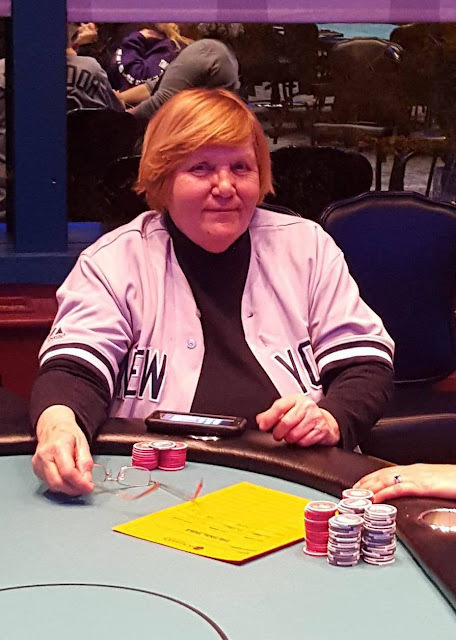 On a board reading [jh][10d][8d], Francine Lee bets, and Elizabeth Krakowski shoves all in. Lee quickly calls. The [9h] on the turn gives Lee two pair, but also brings the straight for Krakowski. The [8c] on the river does not change the hand, and Krakowski is awarded a full double. On a board reading [qd][4d][2d], Alex Begazyon bets 4,500 in nearly position, and the player on the button shoves all in, having Begazyon covered. Begazyon snap calls. The [3c] turn and [as] river do not pair the board, and Begazyon is awarded a full double up. 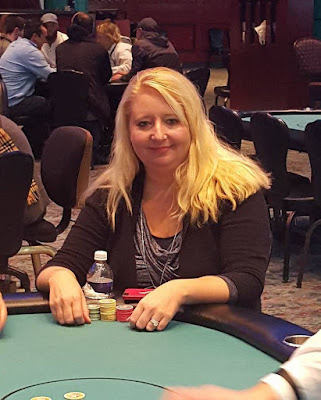 On a board reading [8d][4c][3s], a player under the gun bets 2,400, a player in middle position calls, and Melanie Kaye announces that she is all in on the button. Both players call the all in. Both players checked the [qc] turn and [4h] river. Kaye turns over [8h][6s] for a pair of eights. The player under the gun shows [2d][2c] for a pair of twos, and middle position exposes [ac][6c] for ace high. Kaye takes the pot, and potentially the chip lead of this event. 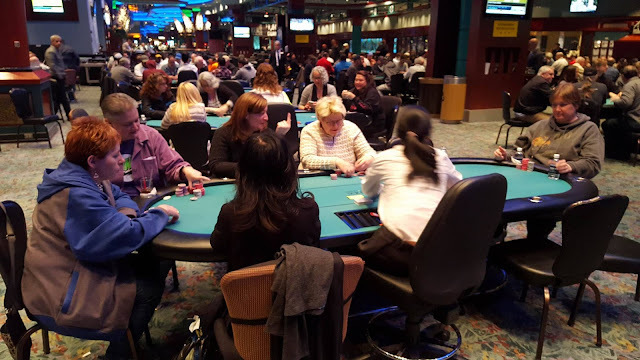 Players in the $1,650 NLH Event are now in the midst of Level 2 (50/100 blinds). So far, we have 99 runners in this event, and it's a very star-packed field. Arguably, one of the most difficult tables includes Chris Tryba, James Campbell, James Magner, Chris Orme, and the newly seated Will Failla. There are currently 66 runners in the $250 No Limit Hold Em Ladies Event. Anyone wishing to enter/re-enter this tournament has until the start of level 7 to do. These women are having a blast so come on down and join the fun!